The Gold Datnoid has long been an industry favorite, and just one look at this healthy large fish says it all! The Siamese Tiger Fish is one of the most handsome large fish in the aquarium hobby, especially with its brilliant coloration when young. They come from the coastal rivers and swamps of southeastern Asia. As a general rule, the number of bars on the fish will tell you its approximate origin. Fish collected from mainland Southeast Asia usually have 5 full bars and ones collected from Borneo or Sumatra usually have 6 to 7 full bars. This fish has long been a favorite species for the large predatory fish tank, especially in Asia. Even though the price remains relatively high, the popularity of this Gold Datnoid endures. In recent years there has been a surge in popularity in Europe and the United States as well. The Gold Datnoid is known by quite a number of equally descriptive names ranging from Siamese Tiger Fish, Indonesian Tiger Fish, Finescale Tigerfish, Gold Datnoid, Gold Tiger Datnoid, Finescale Tigerfish, Yellow Tiger Fish, to the Black Barred Tiger Fish. The Siamese Tiger Fish is one of two commonly available Datnoids, or "dat' species. The other is the Silver Tigerfish or Four-barred Tigerfish Datnioides quadrifasciatus. Another species, the New Guinea Tigerfish Datnioides campbelli will also occasionally show up, and when it does it commands a very high price. A fourth species, the Wide Bar Tigerfish or Wide Bar Dat Datnioides pulcher, frequently called the Siamese Tigerfish and Siamese Tiger Perch, is much sought after but is quite rare. 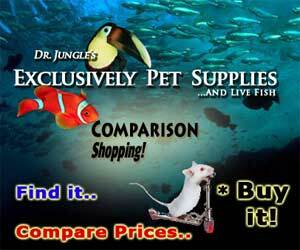 These Datnoid species can get confused and are sometimes mislabeled in pet stores. However they can easily be distinguished with a bit of close observation. For fish identification of these Datnoids by their distinguishing features. see the discussion below under "Description". The Siamese Tiger Fish Datnioides microlepis (previously: Coius microlepis) was described by Bleeker in 1853. Currently there are six species in the Datnioides genus. This genus was revised from Datnioides to Coius and the family Coiidae by Roberts and Kottelat in 1994. Kottelat again revised the genus In 2000 to its current classification of Datnioides and the family Datnioididae. Other common names it is known by include Indonesian Tiger Fish, Finescale Tigerfish, Gold Datnoid, Gold Tiger Datnoid, Finescale Tigerfish, Yellow Tiger Fish, and Black Barred Tiger Fish. This species is found on the Southeast mainland of Asia in the Mekong basin, the Chao Phraya river basin in the center of Thailand, the Musi basin in Sumatra, the Kapuas basin in western Borneo, and in Cambodia. The origin of this fish can be determined by the number of bars on the fish. Fish from Southeast Asia will normally have 5 bars and the ones from Borneo and Sumatra will usually have 6 to 7 bars. These fish are not listed on the IUCN Red List, but may be endangered in many regions from capturing them for food fish and the aquarium industry. It is said to possibly be extinct in the Chao Pharya river basin in Thailand. The Indonesian Tiger Fish inhabits large bodies of waters such as lakes, reservoirs, and rivers. It dwells among submerged trees and roots. The young will eat zooplankton, but as they mature their diet becomes fish fry and small fishes, small shrimps, crabs, worms, and insect larvae. They possibly eat some plant matter as well. The Siamese Tiger Fish is a deep bodied fish with a sharply slanted forehead. It has a golden toned body with black vertical bars. They are usually full bars extending across the entire body. Depending upon the geographic location, they can have between 5 and 7 bars. These fish can get up to at least 18 inches (45 cm) in length in the wild. This size is rare in home aquariums however. In captivity they will generally generally only reach between 9 to 12 inches (20-30 cm). They have a life span of about 15 years. The two commonly available Datnoids species are this fish, D. microlepis, and the Silver Tigerfish or Four-barred Tigerfish Datnioides quadrifasciatus. Two less common species are the New Guinea Tigerfish Datnioides campbelli which will show up on occasion commanding a very high price, and the rare but much sought after Wide Bar Tigerfish Datnioides pulcher, also frequently called the Siamese Tigerfish. Silver Tigerfish or Four-barred Tigerfish Datnioides quadrifasciatus. The Silver Tigerfish is distinguished from the other species by its silver body coloration. It also has more of a "bullet" body shape and up to 7 full black bars, often with 1 to 4 partial bars in between the full bars. This species naturally occurs in brackish waters, which has led to a common misconception that all Tiger Fish species are brackish. The New Guinea Tigerfish will occasionally show up, and when it does it commands a very high price. It is easily distinguished from the other Datnioides species by its intense gold body color with indistinct black bars that are irregular and variegated. The Wide Bar Tigerfish is quite rare but much sought after in the hobby. It is also frequently called the Siamese Tigerfish. Being very similar in appearance to D. microlepis, the two are easily confused, which is further complicated by the cross-over use of the same common name. The Wide Bar Tigerfish is easy to distinguish however. The wide central black band on the D. pulcher will taper to a point before it reaches the ventral surface. Size of fish - inches: 17.7 inches (45.01 cm) - Rarely grow that large in captivity. Usually reach between 9 to 12 inches (20-30 cm) in the aquarium. Lifespan: 15 years - These fish are quite long lived, with a life span of 10 years or longer. 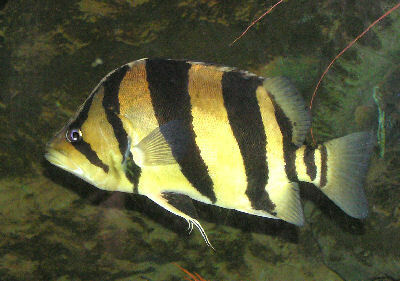 The Siamese Tiger Fish is suggested for a more experienced fish keeper. They are a large predatory fish, though relatively peaceful with similar types of fish. However they need a large tank to live in and these fish demand pristine waters. They can also be difficult to feed. These fish can take a great amount of space and pose a great financial responsibility. Indonesian Tiger Fish are primarily carnivores. They are a predator that in the wild primarily feeds on fish fry and small fishes, small shrimps, crabs, worms, and insect larvae. In the aquarium their main diet consists of smaller fish although they can sometimes be coaxed into eating shrimp, worms or insects. One look at their large mouth will tell you that small tank mates will disappear quickly. They are not aggressive towards other species but will attempt to eat any fish that will fit into their mouth. Meaty Food: All of Diet - These fish can be trained to take frozen foods so as not to contaminate the tank with feeder fish. These are big messy eating fish. If their tank is set up to match that of their natural environment, it can be very difficult to maintain a clean tank. The need for a large external canister filter is very important. Weekly water changes of at least 30% are needed. Water Changes: Weekly - Do water changes of at least 30% weekly. The Gold Tiger Datnoid will swim in all parts of the aquarium. When first purchased however, yours will probably hide near the bottom until it gets accustomed to its new home. This species will require a large aquarium. An aquarium the size of 60 gallons would house small to medium fish, but if you plan on growing this fish to adult size, an aquarium in excess of 100 gallons will eventually be needed. A large external canister filter is very important for maintaining the water quality. These fish will jump, so make sure to have a tight fitting cover. Considering this as a brackish water species is a common mistake. There are Datnoid species that live exclusively in brackish water but the Siamese Tiger Fish is not one of them. They don't occur in seawater and they will not do well in strongly brackish water either. They can do fine in slightly brackish water with a specific gravity of 1.005 to 1.010, but anything more will cause problems. As a matter of fact a very low specific gravity between 1.003 to 1.005, though not necessary, can be good for long term health. In nature these fish live in vegetated areas with submerged trees and roots. They like to hide among the vegetation, camouflaged by their striped patterning, and wait for prey to happen by. In the aquarium it is suggested that they be provided with places for retreat such as rocks and caves, or driftwood. Floating plants and some sturdy aquatic plants set in the substrate can offer a sense of seclusion and also help to provide subdued lighting. The challenge with having a tank designed to provide a more natural environment is that it is more of a problem to maintain. Cleaning up after these big messy predators can be difficult with too much decor. Many people have also had great success keeping these fish in a very minimally decorated tank to get the best viewing. These fish seem to do fine in either setting. Minimum Tank Size: 60 gal (227 L) - For adults, an aquarium of 100 gallons or more will be needed. Brackish: No - They are fine in freshwater but can tolerate very slightly brackish waters. The Siamese Tiger Fish are non-aggressive towards other species but will sometimes quarrel among themselves. They will also attempt to eat any fish that will fit into their mouth. Unless your tank is huge, plan on keeping only one Gold Datnoid. If you want to keep more, you will need a very large aquarium and it is suggested to keep several. A group setting 5 or more is needed to disperse any aggressive behavior. Unfortunately, their low salinity tolerance puts limits the types of brackish water tank mates they can be kept with. Tank mates like Monos and Scats would be great, but these species need too high a salinity content, so don't make good long term companions. Good tank mates are fish of comparable size like archers, green chromides, and big sleeper gobies. Temperament: Semi-aggressive - They will eat smaller fish. Same species - conspecifics: Sometimes - Can be aggressive to its own species unless in groups of 5 or more. Peaceful fish (): Monitor - Only large fish can be housed with them. The Siamese Tiger Fish have never spawned in a home aquarium. It is now being bred commercially in Indonesia. However the method used is, for now, a secret. Ease of Breeding: Difficult - Has not been successful in home setups. With the Siamese Tiger Fish, disease is not usually a problem in a well maintained aquarium. That being said there is no guarantee that you won't have to deal with health problems or disease. Anything you add to your tank can bring disease to your tank. Not only other fish but plants, substrate, and decorations can harbor bacteria. Take great care and make sure to properly clean or quarantine anything that you add to an established tank so not to upset the balance. Gold Datnoid are very resilient once established in a tank. A good thing about the Gold Datnoid is that due to their resilience, an outbreak of disease can often be limited to just one or a few fishes if you deal with it at an early stage. When keeping more sensitive types of fish, it is common for all fishes to be infected even before the first warning signs can be noticed. The best way to proactively prevent disease is to give your Gold Datnoid the proper environment and give them a well balanced diet. The closer to their natural habitat the less stress the fish will have, making them healthier and happy. A stressed fish will is more likely to acquire disease. Gold Datnoid are fairly hardy fish when mature, but are subject to the same diseases as other tropical fish. One of the most common freshwater fish ailments is ich. It is recommended to read up on the common tank diseases. Knowing the signs and catching and treating them early makes a huge difference. For information about freshwater fish diseases and illnesses, see Aquarium Fish Diseases and Treatments. The Siamese Tiger Fish is commonly available but may be relatively hard to find due to its high price. A special order may be required to get one. Other names they may be found for sale as include Indonesian Tiger Fish, Gold Tiger Datnoid, and Gold Datnoid. I like that fish so much. But I wonder where can I find that Siamese tiger fish. Live foods are your best bet, try small fish, worms, and shrimps.